JO ANN KIRKLAND PHOTO | Maintenance Crew Chief Mike Dunning pounds a stake to mark the border of the Edible Garden at the Shelter Island School. The groundbreaking will be on Friday, October 11 at 1:45 p.m. Everyone is invited. When soil, seeds, sun and water come together, you get food. But it was a bottle of carrot-ginger salad dressing that brought the spark of life to the Shelter Island Edible School Garden. One day this past summer at the Shelter Island Farmers’ Market, Vicki Weslek asked farmer Ira Haspel how he came to be selling the bright orange bottles of salad dressing produced by the Southold School. Turns out his wife, KK Haspel is a slow food master farmer and had been advising the Southold School on their Edible School Garden. Soon Vicki realized she had opened the door to a dream she had for her children’s school: a teaching garden for Shelter Island. Ms. Weslek got together with Slow Food East End, part of an international organization that promotes the growing and eating of local foods, home cooking and education. The East End chapter supports farmers markets, nutrition education, improvements in school food and the Edible School Gardens initiative. Vicki said getting the Edible School Garden project going on Shelter Island involved “food and community, paying attention and asking questions.” And when she found her way to the Slow Food resources, she discovered fertile ground. Supported by stipends from Slow Food East End and the Josh Levine Memorial Foundation, KK Haspel is now advising the Shelter Island school garden, and has already provided advice on the site and equipment that will be needed. Funding for the garden is largely in the form of donations of time and equipment from the community, grants and cash donations. Soon the Edible School Garden Committee formed: parents Vicki Weslek and Sarah Shepherd as the garden coordinators, farmers Ira and KK Haspel, Susan Paykin from Sylvester Manor, School Superintendent Dr. Michael Hynes, Maintenance Crew Chief Mike Dunning, Business Manager Kathleen Minder and high school science Teacher Dan Williams. “I’m a gardener myself, and gardening is near and dear to my heart,” Mr. Williams said. Students in Mr. Williams’ biology classes will be able to test the vegetables they grow for protein, nutrient content and microorganisms. A groundbreaking ceremony at the garden site will take place at 1:45 p.m. on Friday, October 11. 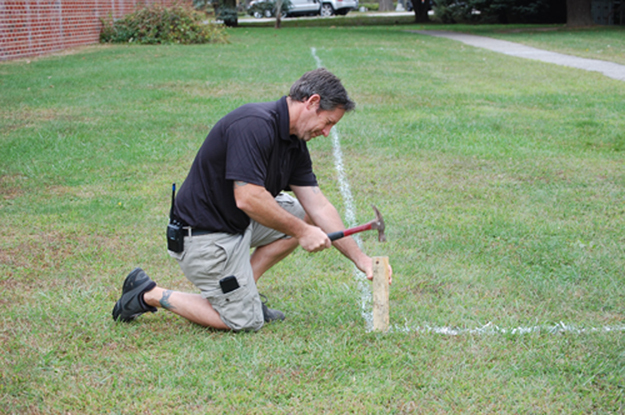 Mr. Dunning has staked and marked off the 30- by 72-foot garden area next to the elementary wing of the school. Dr. Hynes will officiate, the entire school will attend and the public is welcome. Then, on the weekend of October 19 and 20, the really heavy work begins. Donations of time, tools, and compost from the community, have started to come in, including rototilling and stump grinding to prepare the site. Still needed for the first work weekend: a sod-cutter. Community workdays are planned for Saturday, October 26 and Sunday, October 27 from 9 a.m. to 1 p.m. People of all ages are needed to help with digging, edging and soil preparation. Food and community. Add a little sun and water, and this time next year our children will be lecturing us on the nutrient content of our lettuce as we enjoy some of their homegrown salad dressing. October 11: Groundbreaking ceremony at 1:45 p.m. next to the elementary wing, just off the north end of the playground. The public is invited. October 19 and 20: Heavy workdays, donations of time and a sod-cutter are still needed. October 26 and 27: Community workdays, 9 a.m. to 1p.m. Workers of all ages invited. For tool and equipment donations, contact Vicki Weslek at [email protected].